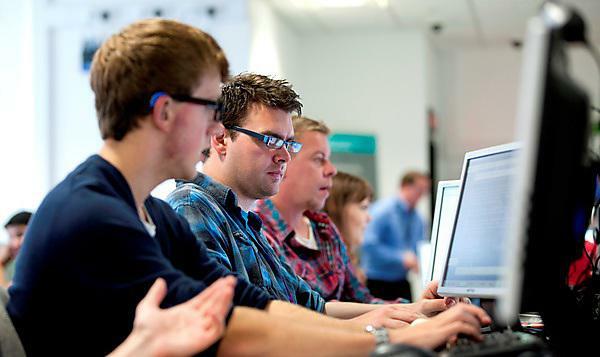 Plymouth University has become the South West regional centre for the Computing at School (CAS) initiative, which will help teachers utilise modern technology to its greatest effect in the classroom. The new Government-funded project will see the University facilitate contact between educators to help them to teach computing in the national curriculum. The project promotes computational thinking, programming and teaching core computing skills to children throughout their school life. The scheme will be rolled out among ten regional centres nationwide, and the official South West launch takes place at Plymouth University on 5 November. The project operates by regional centres connecting interested parties with specially trained master teachers – pedagogue volunteers who help build CAS communities in local areas and organise nearby events. Under every regional centre are several local hubs where master teachers can organise or hold these support sessions and, as well as being the focal point for the region, the University also acts as the hub for Plymouth. The CAS South West initiative will be open to primary and secondary school teachers and higher education academics from as far afield as Bath: supporting grass roots projects such as regular skills sessions, continuing professional development (CPD) training opportunities and networking meetings. Plymouth University Lecturer in Information Systems, Dr Shirley Atkinson, is managing the CAS South West centre and hopes teachers from all over the area will make the most of the help offered. “The CAS scheme is about teaching core computing skills to children as young as five and it is absolutely wonderful to be able to support teachers in this way. For more information or to contact the CAS team at Plymouth University, visit the Plymouth University CAS Regional Centre page.